Snippets of Jack: "So Typical of Teague!" So since I was talking about fathers yesterday, I thought I would return to my discussion about Jack's father, Edward Teague. You see, they have ever had a very good relationship. 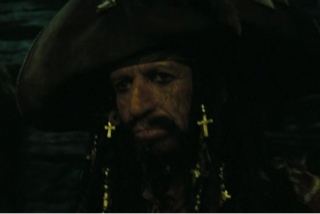 I don't think piracy lends itself to a good father-son relationship. Jack always believes that Teague is trying to embarrass him or get him in trouble. Teague gets really mad that Jack is spending a lot of time with Lady Esmeralda because he thinks that she's too good for him. Such great confidence and pride in his son. 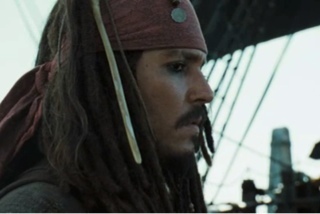 Then, when they are hold a trial on whether Borya is the rogue pirate or not, Jack gets even angrier. You see, everything has to be attested for in a trial. Even before Teague says anything. Jack knows what he will say. "He'd do anything he could to make me look bad in Esmeralda's eyes. He bloody well knows who I was with! She came to get him last night!" He thinks to himself. He could never say that during a trial of course. Teague: "Can anyone confirm what you reported regarding finding Tommy's body?" Jack: "Yes. Melinda was with me when I found the body." Jack is embarrassed because he does not want to make Esmeralda mad that he was with this other woman. But he ends up having to admit that to her and the rest of the Brethren Court. She then has to stand up and confirm that she too saw One-Tooth-Tommy's dead body in the water. Melinda: "Jacky found the body floatin' just as he says he did. Horrible sight, it were." But Esmeralda is cool like that so she does not really mind. She's all too used to the life of piracy, as she is one and later becomes a pirate lord herself. But Jack is still skeptical of Teague. When he finds out that his friend Christophe has also been accused rogue piracy, he gets incredibly mad and blames the injustice of Teague. Esmeralda: "I agree. Christophe should have the right to explain himself. It's not right for Teague to sentence him to hang, based on just the word of a condemned man who gave him up rather than be tortured." Jack snaps there. Jack: "So typical of Teague! Esmeralda, I can't count the number of times he's condemned me, when I wasn't the one to blame. And this time it means a man's life. To hang a man because he's accused by a known liar, captains a brigantine, and owns a turquoise coat-that's no kind of justice. . . Christophe should be allowed to face his accusers. Even Davy Jones, if necessary. Give him the chance to defend himself. Condemning him to hang without an inquiry isn't right." Fifth, sixth, and eighth amendment right there. Of course, this was years before. You would think that Teague, being the keeper of the Code and all, wouldn't agree to an unfair hanging. So Jack takes the liberty in freeing Christophe himself. And then he realizes that Christophe was, in fact, guilty. A little too late now. That's why Jack must leave the world of piracy because he now is deserving of the Same death as Borya, Christophe, and their crews. And Jack just has a feeling that Teague cannot wait to see this "justice" carried out. So he flees, and five years later meets Beckett. Which you could say just causes even more problems. How many people do you think wants Jack hung? Certainly not me or you! 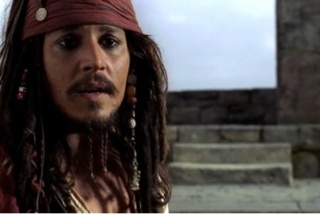 Yes, the amazing Jack Sparrow brought to life by equally amazing Johnny Depp. I had the privilge of meeting Depp in San Francisco in 1997. He was at the book signing of Barnaby Conrad in a little bar and surrounded three deep by women. Jenny, I would have loved to have been there. Thanks to the Snippets of Jack staff. 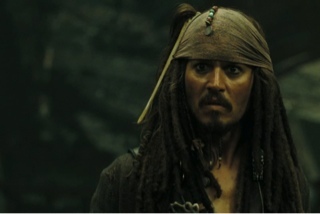 Enjoy the summer and then come back and tell us what we can expect in the future from Johnny Depp and his pirate crew. We hope that we will have some new information soon!